1777 - 1861 (84 years) Has 19 ancestors and 37 descendants in this family tree. The brothers, Joseph and William Fry (l768-1858) joined the family business. However, their mother is credited with "the financial acumen which had enabled money both to be acquired and prudently managed: it was a quality which perhaps neither of the sons inherited". During the 1812 financial panic in the City of London, William Fry, precipitated a crisis, by lending a large amount of the bank's money to his wife's family, undermining its solvency. It was Joseph's wife, with her Gurney financial grasp and her connections, who pulled things through; her brother John Gurney (1781-1814), brother-in-law Samuel Hoare III (1783-1847) and cousin Hudson Gurney (1775- 1864) came to inspect the firm's accounts and, left her in no doubt that they would do "what is needful for us" which, meant a large investment in the W.S.Fry & Sons bank. 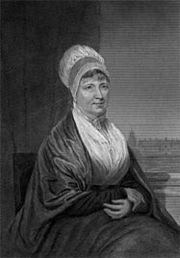 During the 1825 City financial crisis, Elizabeth Fry's relations saved the firm from bankruptcy. When the same problems recurred in 1828, no further Gurney support was offered and on 21 November, W.S. Fry closed. The Gurneys acted as receivers and saved the tea merchant business, placing it under their control with Joseph Fry on a salary of £600 per year. Business failure was not tolerated by the Religious Society of Friends. Joseph Fry was disowned by Ratcliff & Barking Monthly Meeting in May 1829: however he was re-instated, with much admonition in 1838. When they were first married, they lived "over the shop" in St. Mildred Court , Poultry, City of London. After his father's death in 1808, they moved to the grander Plashet House, East Ham . In 1829, they needed to reduce their expenditure and moved to a smaller house in "The Cedars", Upton Lane . After the death of Joseph's sister, Elizabeth Fry (1779-1844), they moved to her home, Plashet Cottage, East Ham. He lived there until his death on 28 August 1861 .